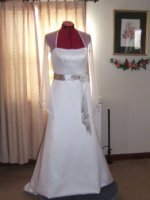 Perfect Wedding Dress Finder.com provides this website as a service. While the information contained within the site is periodically updated, no guarantee is given that the information provided in this website is correct, complete, and/or up-to-date.The materials contained on this website are provided for general information purposes only and do not constitute legal or other professional advice on any subject matter. Perfect Wedding Dress Finder does not accept any responsibility for any loss which may arise from reliance on information contained on this site. Permission is given for the downloading and temporary storage of one or more of these pages for the purpose of viewing on a personal computer. The contents of this site are protected by copyright under international conventions and, apart from the permission stated, the reproduction, permanent storage, or retransmission of the contents of this site is prohibited without the prior written consent of Perfect Wedding Dress Finder. Some links within this website may lead to other websites, including those operated and maintained by third parties. Perfect Wedding Dress Finder includes these links solely as a convenience to you, and the presence of such a link does not imply a responsibility for the linked site or an endorsement of the linked site, its operator, or its contents (exceptions may apply). This website and its contents are provided "AS IS" without warranty of any kind, either express or implied, including, but not limited to, the implied warranties of merchantability, fitness for a particular purpose, or non-infringement. Reproduction, distribution, republication, and/or retransmission of material contained within this website are prohibited unless the prior written permission of Perfect Wedding Dress Finder has been obtained. The Federal Trade Commission requires that Perfectweddingdressfinder disclose any relationship that exist between a product manufacturer or service provider when a review or recommendation about a product or service is given on this site. Perfectweddingdressfinder contains advertising and some contextual affiliate marketing links, for which payment in the form of commissions or fees may be made to Perfectweddingdressfinder, for referrals or for sales of products and/or services written about. The compensation received from these sources help defray the operational and management cost for operating this web site. Note: The content of articles/posts on this website/blog are never influenced by advertisers or an affiliate partnership, nor are articles/posts written for the sole purpose of promoting a product. Perfectweddingdressfinder believe these are good rules and practices that all websites/blogs should adhere to in today's digital world. It is important for you as a consumer to understand the relationship between those reviewing a product and the manufacturer or service provider. All websites/blogs in the United States of America, for which products or services are reviewed or recommended to the consumer, must now have a disclosure policy as part of that review of a particular product or particular service being reviewed. If one is not present then, that reviewer may be violating the law as instituted by the Federal Trade Commission.